For centuries, dehydrating food was seen as a survival necessity and is the safest, most affordable way to preserve foods for long-term storage. I wholeheartedly believe in layering your preparedness endeavors with both short and long-term food sources. That way, you can ensure that you have enough food to see you through any type of event. Many turn to freeze-dried foods as the quintessential long-term food source. This can be both costly and cause problems with your health. Many freeze-dried foods are riddled with sodium, empty carbohydrates, and preservatives. This can cause your entire digestive system to back-up. Perhaps, the freeze-dried 10 year shelf life, isn’t worth the constipation. That said, there is another method that is both cost effective, and more nutritious. For centuries, dehydrating food has been seen as a survival necessity. Many believe this preservation method is the safest, most affordable and best way to preserve flavors of foods. The dehydration process removes moisture from the food so that bacteria, yeast and mold cannot grow. The added benefit is the dehydration process minimally affects the nutritional content of food. In fact, when using an in-home dehydration unit, 3-5% of the nutritional content is lost compared to the canning method which losses 60-80% nutritional content. Additionally, important vitamins and nutrition such as: vitamin A and C, carbohydrates, fiber, potassium, magnesium, selenium and sodium are not altered or lost in the drying process. Therefore, the end result is nutrient packed food that can be stored long-term. In the book, The Prepper’s Cookbook, I outline the multiple ways that one can use a dehydrator. They can dry vegetables, fruits, make jerky, make fruit or vegetable leather, dry herbs, make spices, dry soup mixes, noodles, and even make crafts. When I first began dehydrating foods, I purchased a modest dehydrator. Then, I realized how much I loved it and got a higher end model. Dehydrating vegetables and fruits to use for long-term storage is a great way of including needed nutrition into diets with minimal investment. When dehydrating food, one should use fresh produce or meat. Typically, when overly ripe fruits and vegetables are dehydrated, the texture is not as crisp. For example, if one were to dehydrate over ripe bananas, the end result would be a chewy banana chip as opposed to a crispy banana chip. If a person were to use the ripe fruits or vegetables, they could puree the produce and make fruit or vegetable leather to use later. If a person wanted to rehydrate the food to use in cooking, add boiling water and cover with a lid for 20-30 minutes to expedite the process. Note: it is recommended to add salt after the rehydration process has been completed. Freezer zip-lock bags are excellent for packaging dried foods. Force excess air from bags as they are sealed. Store dried food products in a cool, dry location out of direct sunlight. Use a craft paper inside larger plastic bags to shield dried foods from sunlight. Paper used outside the plastic bags provides a nesting place for bugs or spiders. Another method for storing dried products is to place dried food in a food-quality, plastic bag, then put it in an airtight glass or metal container. The problem of a few bugs in dried foods may be solved by spreading the infested dried food on a cookie pan, placing in tn a 300 degree oven for 25-30 minutes. Bugs and eggs die, and the food is edible again. you say dehydrated food lasts about a year. Some sites say it last 10-20 years. What’s going on? Actually, I have dried fruits and vegtables and then charged them with a vaccum sealer. It has lasted up to 18 years for me. Possibly longer I just had to open them to find out how they tasted. My life experiance. I believe you are referring to freeze dried foods which have a life expectancy of 10-20 years. Typically, depending on the correct storage methods and the type of food your are drying, dehydrated foods last anywhere from 9 months to 3 years. In the Dehydrator Bible, the author says you can maximze storage life by properly drying the food and storing it under the best possible conditions. By comparing the quality of a dried food with the record you kept about its preparation and storage, you may be able to determine an appropriate expectation for its shelf life. I’ve heard the same thing as Joe …multiple times and was for dehydrated foods, not freeze dried. What I’ve read is that if the dehydrated food is vacuum sealed with an oxygen absorber, you can keep it for years & years. 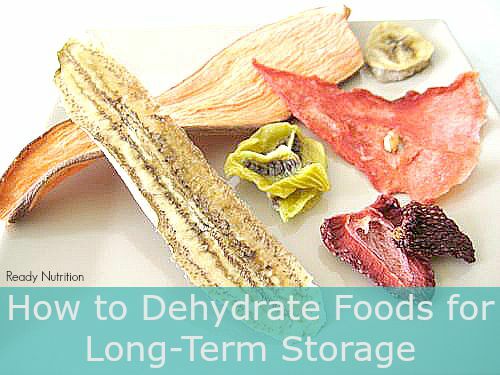 I am very hesitant to use dehydrated in a long-term plan because the info seems so varied. I have done a lot of research and have also heard that dehydrated foods packed in a canning jar with oxygen absorbers will last for 5-8 years. see youtube.com for many articles on dehydrating foods. I have dehydrated foods and stored them in canning jars. I’ve stored them for about 1.5 years and they are still good. Can you take frozen food like carrots, green, peas… and put them on food dehydrator? You certainly can! I would defrost them before you throw them into the dehydrator to speed the process up. No need to defrost. I can fit four pounds of frozen corn in a one quart jar once it is dehydrated. Lisa, Yes you can. I have done it and then add them to soups, stews or just as a vegetable and they are fine. I am particularly interested in long term storage for dehydrated meats. If I dehydrate my lean beef far past the point of jerky, to the point of being crispy, then vacuum seal it in mylar bags, roughly how long is its shelf life? Then when ready for consumption, can it be reconstituted in a soup, stew or casserole? Over dehydrating the meat is not going to make your meat last longer. Once it’s dehydrated, it’s ready for packaging. You can reconstitute the meat in water for meals for added protein and nutrient content. They say that jerky’s shelf life is about 18 months, but I have had some stored for up to 2 years. As long as the food is in an environment where it isn’t subjected to natural elements (heat, moisture, etc), then it’s shelf life will be extended. 1. How lean the meat is. The leaner the meat, the longer it will last. This is because the fatty part of the meat is what leads to it going rancid after time. Consequently, if the meat used to make the jerky is low in fat to start, the resulting shelf life should be fairly high. 3. Packaging method. To ensure your jerky last for years, ensure that you packaging method is clean (new bags, latex gloves, vacuum packaged). great article and I liked the discussion about the foods as well. The advantage of using dehydrated foods over freeze dried foods is at least two fold. Dehydrating at low heat preserves natural enzymes used in digestion. Dehydrated foods are typically higher in nutrition as well. The other advantage is that Dehydrated foods have no added chemicals, not so with freeze dried foods, which are mass produced and the chemicals are added to speed everything up. If you vacuum pack the dehydrated food will it last longer than a year? What can you do, if anything, to extend the time dehydrated food will last? Yes, vacuum sealing dehydrated foods will extend its shelf life. Another way to extend it is to ensure that your foods are stored in a dark, cool area where it is not exposed to sunlight. Our family used to have a food dryer, and we stored a lot of great fruits and things in our pantry. Unfortunately, it broke a while back, and we just finished off our last few cans. It looks like <a href=”http://www.motherearthproducts.com/”>freeze dried foods</a> are the next best thing; I’ll have to try it out! Can dehydrated foods be put in a freezer and used years later or will it collect moisture again? Is putting it in a container and keeping it out of the sunlight the only way to store dehydrated food? As long as dehydrated foods are kept away from moisture, they do not need to be frozen. However, if you are dehydrating meat, I would recommend that you put it in the refrigerator to prolong it. After 1 month, jerky can start going bad if it is left in room temperature due to the fat content. In fact, it is advised to dehydrate meats that are low in fat content. Keeping it refrigerated, or even frozen can make last for an additional 6 months. Can u dehydrate meat and veggies/fruits in the same dehydrator? Not at the same time neccassrily but in general? Thank u! Absolutely! Ensure the dehydrator surface is cleaned well after dehydrating meat. how do I make and dehydrate oatmeal to make granola for a 3 month hiking trip? Here is the recipe that I use for granola. You can make it ahead of your trip and it should last for 3 months… if you can wait that long to eat it. My family devours granola rather quickly. Enjoy! I have a question. I have an EXCALIBUR dehydrator and must say it is fantastic! I live in the costal south where the humidity is sooo high. I am on disability and have a very limited income and cannot run my central air unit below 78-79 degrees in the summer. I have a vacuum sealer also. What is the best way for me to package and store my dehydrated foods? Great question! The best way that I have found is after you dehydrate your food, you can either seal them in a food storage bag and add a desiccant pouch and oxygen absorber or you can store them in a tight fitted jar (canning jars, etc.) along with a desiccant pouch. I’d like to ask the community to answer this one too. What ways do you store your dehydrated foods? No mention of mylar bag storage in this article? Credibility zero.